We’re a big fan of new, independent Mega Drive releases, but normally they come in the form of games. 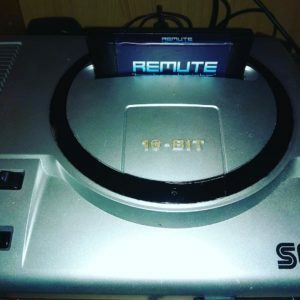 This latest development is a 16 track techno album from German artist Remute. Releasing on March 22nd 2019, this album has been specifically programmed to play back using the Mega Drive’s Yamaha YM2612 sound chip. While the compositions are by Remute, the programming was done by Kabuto and it features graphics by Exocet. Whether this means the cover art or the cartridge also features a graphical equaliser is not known at this time. We’re huge fans of Hideki Naganuma’s sample-driven, hyperactive, pop stylings so we thought it was about time we featured one of the man’s greatest moments. Funky Dealer comes from the Jet Set Radio Future soundtrack and contains everything Naganuma-san is known for: huge beats, sampled vocals, flourishes of guitar work and a certain catchiness that only this man can achieve. If you’re interested in owning a physical copy of the Jet Set Radio and Jet Set Radio Future soundtrack, SEGA re-released it on CD last October. Click here to order a copy!